Last week I had the privilege to join the leading lights from the field of play, learning, child development and creativity gathering in the sleepy town of Billund, home of the LEGO Group and the LEGO Foundation, and dedicating three days to re-defining play and re-imagining learning. The Conference this year sought to make a break with the past and introduce a far more ambitious agenda, focusing on action and building a coalition behind the importance of playful learning. Play, as many of the distinguished speakers noted, has come to be seen as a frivolous activity, a waste of time for children, whose every waking hour must be filled with learning and education, to prep them for every conceivable test at ever earlier ages, determining their choice of schools and support later in life. At the same time, many pointed to the sheer futility of education, when every answer is a Google search away. Not only are children more stressed than ever, stress is the most significant inhibitor of healthy brain development, yet educators and policy makers are only advocating more of what we know isn’t working. It seems education is ripe for a revolution, where playful learning is at the heart of unlocking the intrinsic motivation needed for lifelong learning, the only way to succeed in a world where the only constant is change. John Townsend, writing for Forbes, outlines the groundswell of initiatives world-wide to change the course of education. He lists some of the many initiatives, championed by the participants of the LEGO Idea Conference, that show the potential to fuel the much-needed revolution. To take the opportunities further, the third day was dedicated to action as to create change, requires change, starting with ourselves. Given my role as head of LEGO.com I chose to join a group focusing on the role of Media in Re-imaging Play and Learning. 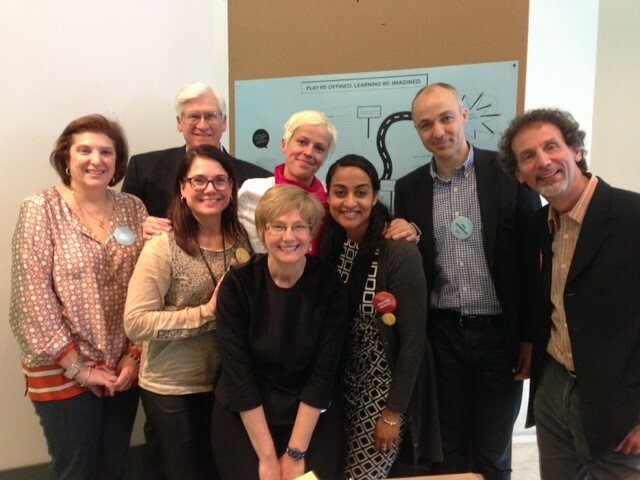 Here I found myself in the midst of an inspirational group of leaders from as far afield as the Bernard Van Leer Foundation, LEGO Education, Capital of Children, Sesame Workshop, Room to Read and Interactive Denmark. Our mission was to imagine a newspaper headline in 10 years time that captured what we wanted to do to create the change we want to see, and tapping into the power of media. With some iterations it crystallised into: What Happened to the Classroom? With Know Networks children could develop their own questions; create the peer networks they need in order to answer those questions; and download fun curricula for the technical skills they need — think math skills (Dragonbox) or vocabulary (FunBrain). When they have created the thing they wanted to create or solved the problem they want to solve, they create and build a new layer of the Know Network. Like online collaborative gaming, the basic framework could be created by adults but just as a seed, really, from which children’s own intrinsic curiosity could guide the growth of the networks. Imagine if Khan Academy was just a base platform through which children developed their own questions to explore, grew their own networks, pulled from a menu for technical teaching and knowledge and pulled other kids into their networks in order to learn from each other? Our group thought to scrap the concept of diplomas and introduce the concept of do-plomas that recognize immediately the value of successful problem solving and innovation. Know Networks learning outcomes could be measured in a very practical way by asking two questions: Did the children solve the problem? Did the children create something? And the non-cognitive skills could be measured by following the process of discovery. Placing the emphasis of the Conference solidly on action, the LEGO Foundation furthermore announced it is throwing its financial clout behind a joint initiative to accelerate this development, called the Re-Imagine Learning Challenge or #Play2Learn in partnership Ashoka Changemakers, to give thousand to 10 champions of learning through play, selected through a global competition this year. Nominations for the early entry deadline need to be in before the 21st of May 2014. See the full timeline and more details on the Play2Learn site. We in our little group (below) have some more work to do together to take our thinking further, but we hope that if this resonates with you, you will join us on this quest to bring Know Networks and Do-plomas to life. Can Playtime Change the World? Thanks for sharing this / it’s so true, google doesn’t have all the answers! I wish I was at this conference!